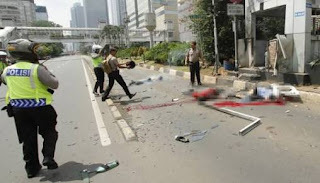 Bombing in Jakarta on January 14, 2016 terror attacks are carried out by ISIS. The attack was very similar to what happened in Paris in 2015 ago. Similarities seen in bombing undertaken in crowded places to be followed blindly against the police action. Bombing in Jakarta making the police in Bali set a security emergency. Clearly visible police posted everywhere. On the street, in the center of tourism, in Kuta. Tumben police as much as it looks on guard. ISIS attack was expected to occur in Indonesia since December 2015. The threat of blasting have been warned. A lot of information that says that there will be a massive bomb blast in Indonesia. Bali is one area that became the target of a bomb attack. Since December 2015, the police had been on full alert to provide security against terrorist attacks. Places vital and is considered as a region vulnerable to terrorist attacks continue digaja by police. Kuta is one of the most dangerous to visit at this time.